Goji Berry the fruit of long living (Lycium barbarum). 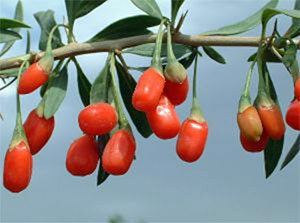 Goji Berry is a well-known plant in ancient China and Tibet. Goji is extremely easy for cultivation. It is characterized with a high resistance to abiotic factors like low temperatures and drought. Goji adapts well on all kind of soils – from poor sandy soils to black earth and heavy clay, from alkali to acid soils. When left without regular pruning Goji Berry rapidly develops large bus and reaches 1.5 m in height. The size can be controlled by regular pruning for closing the branches that will ensure more fruits. Goji can be maintained and formed as a hedge. Goji Berry starts the formation of fruits from its second year after planting, and produce fruits during the whole summer and autumn period by the end of October. The plants reach its maturity on its fifth year. The annual yield from Goji berry fruits during its third year is about 2200-2500 kg/ha of dried fruits, and 4000-4500 kg/ha dry fruits on the fifth year. It is recommended to plant Goji with density from 3500 plants per hectare or 1.80m x 1.60 meters distance in between. The plants have to be adapted and stabilized before planting in field. The recommended period for planting of young planting material from Goji Berry is from April to October. © Copyright 2017 Bio tree Ltd.